Venezuela is in the midst of the greatest economic crisis in its history, with low oil prices, hyperinflation, medicine and food scarcity, and socio-political conflict, with over 100 days of protests and 120 people killed during demonstrations. According to political analysts, the country is facing total closure of the few democratic spaces that still remain through the establishment of the National Constituent Assembly (ANC, for its Spanish acronym). The assembly was convened for President Maduro to oversee the rewriting of the constitution, which was promoted and approved by the now-deceased Hugo Chavez in 1999. The assembly election day, which was held Sunday, July 30, amidst violence and repression, ended in 14 deaths at the hands of the government, and the arrests of Maduro’s opponents Leopoldo López and the metropolitan mayor of Caracas, Antonio Ledezma, who were under house arrest. The United States has begun applying sanctions, another turn of the screw as the conflict escalates. After the parliamentary elections on December 6, 2015, the Venezuelan opposition, the Democratic Unity Roundtable (Mesa de la Unidad Democrática, MUD), composed of political parties opposing the Maduro government, won a legislative majority. Meanwhile, the Supreme Court’s Electoral Chamber ordered the suspension of three indigenous members of parliament—representatives of the state of Amazonas—while they were investigating alleged irregularities in this region’s elections, pointed out by Chavists. It was in this context that Parliament was established. Opposition groups quickly began a constitutional process to collect signatures calling for a revocatory referendum in the National Electoral Council (CNE), which would democratically permit the early removal of the president and would need to be implemented before 2017 and allow the indigenous parliament-elects to assume their seats. The revocatory referendum process was delayed by the possibility of reaching political agreements between the parties at the so-called “dialogue table”—which started in October 2016—imposed by the government and promoted by his mediators, former presidents Jose Luis Rodriguez Zapatero (Spain), Martin Torrijos (Panama) and Leonel Fernandez (the Dominican Republic), as well as representation from the Vatican. This dialogue did not result in any progress, which led to the opposition’s withdrawal among allegations that it was a government strategy to “buy time,” postponing the electoral polls on the referendum and delaying the scheduled elections for mayors and governors. At this time, the CNE suspended the MUD signature collection process, alleging “fraud” by a government’s claim through the cautionary measures in the country’s different states by judges of first instance. The opposition decided to leave the dialogue table as it “did not guarantee the return to democracy in Venezuela,” requesting new negotiations and the guarantee of four specific requests: Respect for the Assembly’s competences; the opening of a humanitarian channel to assist with the medicine and food crises; an electoral timeline; and the release of political prisoners. This conflict poured into the streets with anti-government demonstrations. April 2017, protests erupted throughout the country, and with them, heavy repression and persecution by government armed forces, resulting in over 110 killed, over 2,500 arrests and 300 political prisoners, to date, after 100 days of protest. In May, President Maduro convened the National Constituent Assembly, basing it on what is known as the “electoral foundations.” This custom presidential decree removed the traditional electoral bodies to create an alternative Congress, adopting a policy of “one member per municipality” without considering the voting population in each constituency. July 8, in the midst of revolts, the Supreme Court of Justice—controlled by Maduro—decided to release the political prisoner garnering the most media attention, Leopoldo Lopez, for “humanitarian reasons,” though he would remain under house arrest. The former mayor of Caracas, Antonio Ledezma, has been in the same situation for over two years, as have other figures of the Venezuelan opposition. According to data from the Foro Penal Venezolano (Venezuelan Criminal Forum), there are more than 400 political prisoners in Venezuela, and some 350 civilians have been tried in military courts. 1) Do you reject and refuse to recognize the writing of a new constitution proposed by Nicolas Maduro without the previous approval of the people of Venezuela? 2) Do you demand that the National Armed Forces and all civil servants obey and defend the 1999 Constitution and support the decisions of the National Assembly? 3) Do you approve of the renewal of public powers as established in the Constitution, and the holding of free and transparent elections, as well as the formation of a National Unity government to restore constitutional order? In a civic conference, the opposition obtained 7,200,000 signatures rejecting the constitution, although the government did not recognize it. 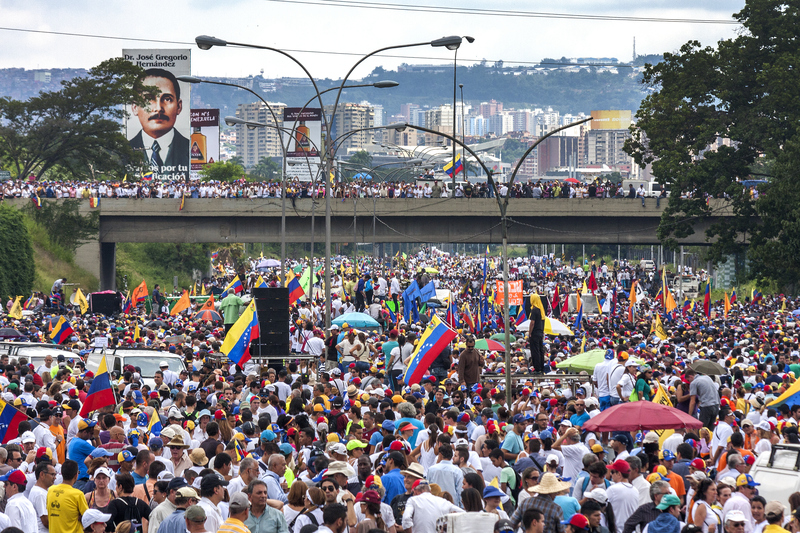 Protests and repression continued, and a national strike was called for 48 hours, which, according to the opposition, saw 70 percent participation of the country’s population. Its purpose is to create a new Parliament to write a new Constitution. In a situation at risk of authoritarianism, plenipotentiary powers and rejection of Chavez’s 1999 Constitution, representatives of Chavism, called “critics,” raised their voices against what they considered a “betrayal of his legacy.” A spokesperson for this group, current General Attorney Luisa Ortega Diaz voiced her disagreement, escalating the conflict. Sunday, July 30, the CNE held a vote on the Republic Plan throughout the country, with members of the Armed Forces overseeing and guarding the process. The day was marked by high abstention. The National Electoral Council reported 41.43% citizen participation—translating into 8.1 million votes—though the opposition refutes these figures, claiming only 12 percent participation. While the voting centers were empty, the streets were filled with demonstrators who tried to block the process. State security forces and paramilitaries attacked civilians, resulting in 15 deaths. Today, countries including Peru, Argentina, the United States, Switzerland, Colombia, Mexico, Canada, Panama, Brazil, Costa Rica, Norway and the European Union Parliament have officially rejected the Constitutional Assembly, refusing to recognize it. The United States has applied sanctions to freeze the Venezuelan president’s assets and prohibit him from conducting transactions, and speculates on the possibility that sanctions will be applied to the oil sector, which, according to some analysts, could lead to a definitive turning point in the situation. Venezuela is navigating a new and uncertain period. The events there are developing before our eyes. Article written by the Latin American analysis team at LLORENTE & CUENCA.